As you know by now, while countless ways promise to earn you money online, few of them actually work. Some of them work at the beginning for a few people, but they quickly turn into unprofitable as soon as more people start using them. One of the best, proven ways to succeed online is trying new products as soon as they hit the market. Lately, making money using your smartphone has become the new trend as smartphones become more capable than ever. A simple device that lies on your desk might have the potential to earn you a decent income. Make no mistake I don't intend to make you learn to code or build a new app. 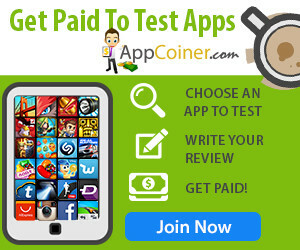 You can make decent money just by writing your honest opinion about new apps thanks to App coiner. Though at first glance it may sound to you as a too good to be true scenario, I assure you that it exists as more and more developers are willing to pay you money to get positive traction. You just have to write an honest review and promote their app. Developers cannot afford to deal with every user individually, so they use App Coiner to access a large pool of users like you and me. App Coiner is a website that is subscription based and establishes a connection between developers and reviewers. After you decide to become a part of their business you have to download one of their featured apps and test it. Then you have to write about your experience and express your honest opinion, and you will be paid. I decided to review this business model to provide you with a reliable opinion about App coiner. Their membership site works like a platform where you can scan for all the available apps to review. To begin with, you will need your smartphone or your tablet. You should know that the majority of featured apps are based on the Android platform, and support newer versions of this software so make sure you keep you phone or tablet updated. App coiner's greatest advantage is that you don't need any skills despite being able to write in English. The site is heavily moderated so expect some time before your review gets approved. Also, make sure you proof-read your work, so they don't ask you for any revision. App coiner's system consists primarily of four steps. 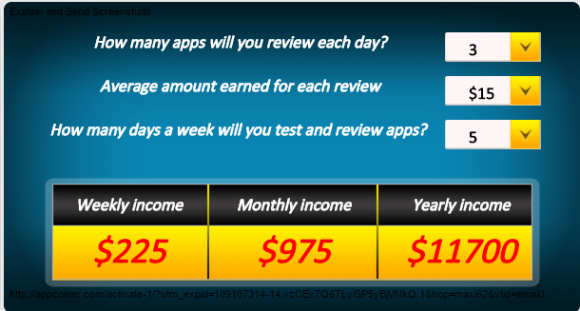 To be able to get paid for reviewing apps you have to pay a one-time fee of $27. However, if you consider it as an investment, you will be rewarded with many more money. This fee allows you to access their massive database and scan for available apps. The support team says that this fee covers all of their hosting, maintenance, and salary costs. After your sign up is completed, you will get your unique login details. App coiner's database contains a wide variety of apps both for Android and iOs devices. A useful tip is to select those apps that are created by well-known and experienced developers as they will regularly update and remove bugs from them. As soon as you select an app, you will be provided with a unique link that is an affiliate link that establishes a connection between you and the app. Use this link to review the app because it enables you to get paid as soon as someone reads your review or downloads the app using your unique link. After you have downloaded the app, it's time to test it. When you feel that you are ready to express your opinion, write your review using your log in details. If you are careful enough and avoid any Grammar mistake, your review will be approved quickly. Otherwise, it will keep getting rejected if you don't correct it. It's important to establish that you are not paid for writing reviews. Instead, you are paid as soon as someone reads your review and decides to download this app and makes an in-store purchase. You don't need to worry about who is going to read your review as App coiner takes care of the necessary promotion which can bring the maximum exposure possible to your review. It is important to know that your payments will be weekly, and you can collect them via Payoneer, direct deposit and check. Also, every app that you review contains up to $400 in possible app purchases. New apps are added on a weekly basis, and the website provides suggestions and educating material on possible ways of promoting your website and getting more people to view your reviews. This educational part is critical especially in our modern internet economy and will give you many valuable lessons. The interface is easy to navigate as well as intuitive. You only need a smartphone and some basic English knowledge. You can review as many apps as you want. There is no limit. As soon as you get approved, you can start reviewing in a matter of seconds. There is a 60-day money back warranty. You can only access this database via an Internet connection. You have to stick to their instruction to attain a considerable profit. I cannot recommend this website enough, especially for those who need a steady and reliable income stream. I suggest you get on board and take advantage of this opportunity. App coiner's developers take the responsibility of promoting your reviews in the best way possible using their various resources and connections. Additionally, worrying about losing your money is not an issue as they will refund you the full amount if you don't like their service for any reason. Also, this means you can get 60 days of risk-free access to their database and see if it works for you. I can tell you that making that $27 back will be very easy as soon as you understand how this system works. Last but not least, one of App coiner's main advantages is that the more time you allocate testing available apps, the more experienced you become as an application tester. That way your credibility rises and your reviews start getting more traction and attention resulting in more money for you. This opportunity exists and thousands of developers are looking for experienced and reliable app testers. Hey, I love this article. I’m thinking of going with App Coiner. What do you genuinely think of it? I keep reading reviews about it but can’t make up my mind if I’m honest. After reading this review I can kind of justify going ahead with it but then again in this review they have tones of links to the website so not too sure if they are gaining something for writing it. https://www.freethecash.com/single-post/2017/10/30/App-Coiner-Review-–-Is-it-any-good I would love an opinion from someone with a bit more expertise. I just want to know if I can really make any money using this.